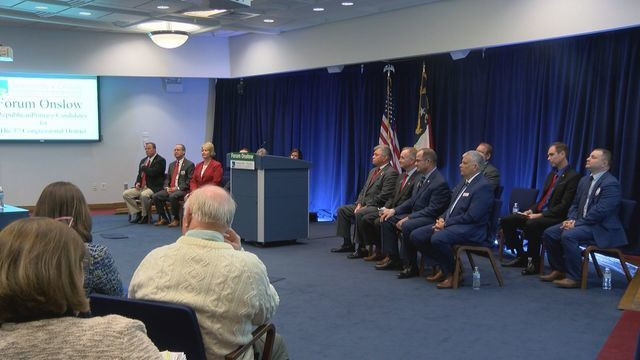 JACKSONVILLE, N.C. (WAVY) -- A forum was held at Jacksonville City Hall Tuesday afternoon for candidates running for the late U.S. Rep. Walter Jones' seat to weigh in on the issues. The forum allowed those running for office a maximum of five minutes to answer as many questions as possible. Questions were randomly chosen. Four democratic candidates were the first party to speak on the issues. The discussion included social security, funding for the military, drilling on the coast, and immigration. Both libertarian candidates spoke right after. Thirteen of the 17 republican primary candidates participated in the forum. The special primary election in District 3 is April 30.